What A Day! – Special Edition, Washington, D.C. In Hebrew School I learned a song which ended with a shout of Azza Yom! (Pronounced with the long “a” sound. Of course the Lord ordered our steps. We spent most of the day in the Capitol. Praying as we walked the halls. Met an amazing group of women who knew Brett Kavanaugh personally, some went to school with him. Some had worked for and with him. One had daughters on the basketball team he coaches. As the day went on, large opposition group of a few thousand literally shut down the Hart Senate Building. The sense of peace we experienced after our authoritative prayer last night (which we prayed right up to the door of the Supreme Court Building) lasted through the day. Peace was upon us as we walked through crowds of people who don’t see things as we do, some of whom voiced ugly accusations to us individually. They received lots of press attention. We were interviewed by one AP cameraman, but I doubt they will show it. During the relatively short shutdown, the Lord had placed us in Senator Grassley’s office where we met powerful pray-ers. One young black woman, in particular, led out in such anointed prayer that we could totally agree with. I sat next to a WWP from Virginia! What a delightful woman. And throughout the day people in the halls would recognize us and identify themselves as those who appreciated the Lord’s ministry through us. Andrea from Washington D.C. has guided us. She graciously opened doors through her contacts here that she has made through many years. Heidi, who leads an intercessory prayer group in San Antonio, is also very knowledgeable of our government here. And is an integral part of our group. With the LORD first and these two women we are in good hands. We have received such favor we will have seats in the Senate gallery at the two upcoming votes. Be sure to turn on c-span tomorrow starting at 10am. still not sure when it will start but the Senate will consider and debate a procedural measure. They will vote on whether to proceed to a vote on Kavanagh. Once vote takes place tomorrow a final vote will be about 30hrs later on Saturday—maybe 5pm. There will be some debate before (maybe an hour). Not sure when he will be sworn in. Will expect to meet you in prayer at the throne tomorrow. I am telling everyone we meet that thousands are praying with us who are not here present. Uppermost in my heart is prayer for our beloved country to heal from the division the enemy is aiming at us to defeat God’s destiny for this nation. As I began to read my eyes filled with tears. What an awesome God we serve. I am so encouraged. Thank you Miss Billye, for your obedient heart and your unwavering willingness to PRAY and to teach and encourages us pray-ers. I am beyond humbled that The Lord led me to your ministry. I am so thankful to join with you and so many wonderful brothers and sisters as we bring our President, Judge Kavanaugh, our country, Israel, and so much more, before our faithful Father God. It is all so amazing to see how every joint supplies. We are seeing HIM move right before our very eyes and it is just AWESOME!! Glory be to God!! Hallelujah!!! Faithfully praying in Kansas, Robin S.
I too, am in awe of our Faithful Father’s work on behalf of this nation, birthed many years ago for the purpose of serving Him! Every morning, before I get into prayer, I make the following request: “Lord, show us your Glory”! The simplest definition of His “Glory” is GOD, MANIFESTING HIMSELF AMONG US! As we look at everything that has occurred during the last two years, I can truly say He has been showing us His continual manifestation in our government to the point where it is turning this ship around! Also praying from KS, and rejoicing that our God reigns and Jesus is Lord!! Iam praying with you and all the people in America. Glad your on the front lines Billye. Praise God! I didn’t watch all day on tv but I would check in from time to time, knowing you all were there, praying over all throughout the day in the spirit!!! Up this morning, praying #FOA btw I missed you live Wednesday but I learned so much from your daughter and have watch again taking notes!!! Love you all! We are standing with you now in prayer. Thank you, Billye for all that you do.ur God is Greater. Reading and praying from Ireland. Thanking God that I have such access to His wisdom through you. Media coverage here of this issue is vicious. I am in awe of all prayer is achieving by His graveand I am a seasoned prayer. Truly He is the light and the darkness cannot comprehend it. Have been with you, Judge Kavanaugh and our senators in prayer off and on all day. The Lord has repeatedly given me Psalms 16,17 and 18 to pray over this situation during the two last weeks and a new phrase in tongues when I start praising Him for the victory. Thank you for keeping us updated. God bless you and keep you. Joining you from many nations. I woke up this morning (about 3-4 hours ago); with an assurance, a quickening in my spirit that it was done! The victory is won! Praise God!! Thank You and yours for being in Washington at this critical time. I was so glad , and His Peace was upon my spirit to know those who war with His Authority are walking and praying for our nation. Revealing truth and protecting the Constitution and the lives of the unborn. 2 Tim 4:17But the Lord stood with me and strengthened me, so that through me the proclamation might be fully accomplished, and that all the Gentiles might hear; and I was rescued out of the lion’s mouth. I saw some of the news today from the CNN point of view…. I wondered in my heart, how is this going to come out? So…I am so relieved to know that Sister Billye and the WWP’s were there with “Boots- on- the- Ground” in Prayer, doing warfare for our special Nation !! God’s Grace and protection be upon you all and Thank you for going to the Battle Ground ! We have the Victory!! Glory to Our God! I’m overwhelmed at the privileges that come from following Our Beloved Lord Jesus and obeying our King’s orders to pray “without ceasing” and “in one accord” at this moment! All that you’re sharing with us is marvelous! I feel like we’re walking with Our Lord within Psalm 2 and Psalm 110 and watching Our God performing His Word. It may seem that what is happening is a small thing in the eternal Perfect Plan of Our Father, but like the loaves and fishes, The Blessing of The Lord our Beloved Jesus restored to us multiplies for the good of all. Praying here in agreement in Colorado.Mob mentality is not of Gd. I too feel His Shalom Peace. I pray for The Priestly blessings to be upon you. I am in agreement with you. Righteousness prevails in this situation with Judge Kavanaugh . All the unrighteousness behavior and words and decisions that do not bring Jesus glory, fall to the ground and fall apart. To God be the glory in the decision made to vote him into the Supreme Court . I agree with all the prayer warriors in Washington DC . We pray and stand solidly with you in the throes of all of this and in His great Love. Thank you, Shelli and Hannah! For going to Washington to pray. Praying with ya’ll for Judge Kavanaugh our country our President and cabinet, congress and senate. God bless you all and God Bless America! Jesus is Lord! Thank you for sharing. I have been praying from my seat of authority over Judge Kavanaugh and his family. Also that the Lord will have his way in our nation and in all branches of govt. Shalom. I’m so glad you were able to personally go to DC at this critical time. My husband and I stand with you and the many courageous prayer warriors praying for our great country. Jesus is Lord! Glory to God! He hears the prayers of the righteous! Thank you for your Godly presence at the Capitol. Praying with you for our Nation. Glory to God. For all of you putting boots on ground in Washington. I thank God for your obedience and prayers. Many are standing in prayer. I decree the blood of Yeshua keep you all protected and strong. May we all see the fruits of our labor. All to the Glory and honor to God…. So grateful that you are there my house is praying for you all and God’s blessing on the United States of America. As you all are in His Secret Place, Under His Wings. WWP praying here in Florida. What God has determined no man can defy. I am delighted and grateful that you are updating us. May God keep you strengthened and sustained in this assignment. Shalom, shalom. In prayer of agreement with you for Kavanaugh, President Trump [& family] and the Nation. Covering all pray-ers in D.C. with Ps. 91 and Rom 5:17. Expecting God’s GLORY to be seen in America! THANK YOU for keeping us updated throughout these critical days through FB and blog posts. So thankful and such a great feeling to know you were there. God bless you, praying with y’all . Thank you for always following the leading of the Holy Sprirt by going to Washington DC. Praying believers are needed there and others are joining you in the spirit. Shalom! Thank You for all you and your family do for the Kingdom of God.Thank You for teaching us How to Take Authority. Thank You for the Updates Also. All the Glory To Jesus Our Great and Mighty God. As a WWP in Canada, I am standing with you in prayer. God always have the last word. What He determines will come to pass. I am also a WWP from Barrie ON Canada. May His anointing be upon you with power…. So thankful for your representation in Washington DC. In total agreement with prayers. Thank you Mrs. Billye, Shelli and Hannah for being in Washington at this time of great consequence. I fully believe the Supreme Court is the destiny of this wonderful man, Brett Kavanaugh; raised up by God to be a Samuel to this generation. Continuing in prayer all through the vote with all of you. HAND WHEN WE PRAYED !!!!! WE HAVE IT, WE TAKE IT, WE HOLD IT IN OUR HAND, NOW ! satan, you are a DEFEATED FOE. We are with you in the spirit & take our place in our seat everyday & THANK GOD FOR THE VICTORY !!!!!!!!! I am praying that the voters will hear a louder voice from God than from the crowds and political persuasions! May your voice be loud in there ears and hearts Abba Father God! We thank you that you hear the prayers of your covenant people . We thank you that your name is above every name that is named ! We thank you for the victory in Jesus name . Today I was watching Pat Robertson on CBN as I quietly went about my house work. I was aware of you, Hannah, & Shelly being the “Boots in Washington” while we WWP’s we’re at home lifting your arms! I had a peaceful heart – I was confident that our united prayers were availing much! I will watch noon prayer on the archives and continue to pray with you tomorrow! Shalom – Shalom! I’m standing on John 15:7-8! I am glad you are doing all these wonderful things for GOD and teaching me more on prayer and how to pray for our country .thank you DR BRILLYE BRIM. I am praying in agreement with you. I thank the Lord for your faithfulness. Thank you ladies for your obedience. It is a blessing to know you have boots on the ground as we join you from afar. Praise Adonai for strengthening you and anointing you for such a time as this. You go girls!!! Proud to be your bro. in Yeshua/Jesus and a WWP. Thank you Lord for all you done and going to do with soon to be Supreme Court Justice Kavanaugh. Thank you Lord for protecting Billye Brim and everybody that was with her today. Jesus is Lord over USA. There are people praying in England too, knowing that what starts in the United States always affects us here as well. We add agreement to yours, madame, from this Texan who happens actually to be in Cleveland, TN for a Perry Stone Main Event Conference. We have just as much anointing right here in the Volunteer State as we even do back home in Texas and believe with you that this temporary storm for the esteemed judge shall too pass as quickly as.it originally began. Shalom rubakah in Him who laughs at those who attempt yo counsel against Him, His purposes, and His plans!! Thank you for being our “Point of Contact” in Washington DC! Let God arise and His enemies be scattered!! Victory in our Land!!! God Bless AMERICA! Billye and others are indeed a sign for America that Christians do care for the nation. Bless all of you that are gathering IJN. Our wonderful Jesus is listening and acting. Here in Australia an amazing thing has occurred through prayer. We have a Pentecostal Christian as Prime Minister. Bless President Trump for his stand . WHAT A DAY IS RIGHT! Quote from your book: Authority of the Believer & How to use it. “ Understanding the authority of the believer, is of top importance in working with God in prayer in the end of days. For one thing, believers who understand it are not afraid. They humbly operate in authoritative power. “ We stand together with you! Thank You faithful servants. Thank You God that you change hearts and move Judge Kavanaugh into his Supreme Court seat. Pour over him grave and peace. Praising God and praying with you for victorious appointment and swearing in of Judge Kavanaugh! Blessings to all standing for God’s purposes to be accomplished! Thank you so much for being there!!! Billye & Team: Blessings on you! Thanks to you & all who are carrying the Light into the headquarters of our government. Darkness cannot remain in the presence of Light! I’ve been tasting victory & rejoicing since Wednesday Prayer, led by Brenda. Her personal testimony she gave is very powerful, & after she spoke it, Holy Spirit mightily moved. The group present there, (so thankful I could livestream it & add my supply!) became like an orchestra, directed by Holy Spirit–beautifully effective in bringing BREAKTHROUGH! Now all of you have delivered the final blow right there @ the scene of such crime wrought by the enemy through his puppets. ALL GLORY AND HONOR TO OUR GOD! There is NONE LIKE HIM!!! Standing with you all as you represent all of us! God bless your steps and God bless America. I notice that you had a notification at the bottom of one of your emails of where we can click if we don’t like your blog. Of course, I didn’t, because I LOVE your blog. Thank you for the encouraging words from the scene. God bless you! I’m rejoicing that God has sent you to pray. May His Will be done for this country! Continual prayers here too! May God receive the glory as we witness the victory of answered prayer. I am so thankful for your ministry. It gave me such peace to know that you and a team of pray-ers were going to Washington DC. I thank God for what you have been able to do while being there in Washington DC in person. Please know that you and your team represent an innumerable group of people who love the Lord, this nation and your ministry and are in agreement with your prayers . So you represent a much larger number of people than many realize. Thank you for your time, energy and faithfulness to pray and to go and pray in this situation and at this time. I strongly believe that it was ordained of the Lord and that because of your obedience God’s will – will be accomplished in the appointment of Judge Kavanaugh to the Supreme Court. I am in agreement with the prayers you are praying over our nation. God Bless You, God Bless America, and may the glory of God shine all across our nation and all around the World and may it shine brightly over you and your ministry. Thank you for all you do! Praise God for you all! I am also praying and fasting from home for Judge Kavanaugh to be voted into his Supreme Court seat. Pour over him God’s grace and peace and Ps. 91! May God receive the glory as we witness the victory of answered prayer. By the blood of Jesus I pray, Amen! Billye, from a DFZ prayer and one of your prayers Wed. mornings. I resident in Harrisburg, Pa . I am known as the Kingdom Warrior Evangelist Joyce Vanderhorst-Gamble , God had told me to pray at the Dome every Sunday morning.While I am praying, giving Praise and Worship to our Father I am also breaking the chains, removing any or all strongholds that are over the nation. I pray for Israel,,,all that are suffering with homelessness, addiction,everything that is unclean. 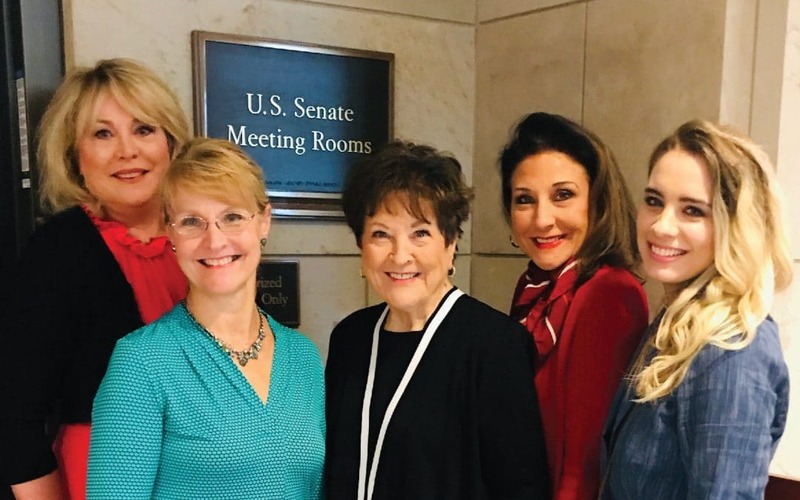 I am with you Billye Brim and I am so Glad that you and several ladies are at Washington DC “The Capital” Praying… All for his GLORY… and other woman who are employed there joined in …..What an Blessed event. Praying everyday! Wednesday noon prayer said we have the victory! Never cease to be amazed at how Awesome our God is! Blessed beyond measure to see you Miss Billye in Washington DC during this crucial time in history! To see the favor you walk in with the angels of the Lord surrounding you assures me that God has this! Grateful He knows the beginning from the end and His plans will go forward as we pray. Thank you for being our witness to what God is doing in America through His appointments to positions of authority. Love you so much! More and more blessings to you! Praying for you as you represent us “wwps” in Washington. Grateful because He is Faithful. So excited to see what God is doing. So happy to see you there in DC knowing you and the group were walking the halls praying. Happy for vote #1. . . .we be praying for vote #2 tomorrow. Thanks for SHARING Your Ministry of PRAYER and INTERCESSION with us, and the Testimony of Your time in Washington, D.C. I would love to become a PARTNER with You, as my wife and I have always Loved. Esteemed, and HONORED Your GIFTING in the KINGDOM of GOD. Praise be to God! I feel such a shift in the atmosphere! I stand in agreement. Praying praying praying! Yes – that shift in the atmosphere, definitely. Hallelujah! Praying and rejoicing this a.m. as we take this mountain. My devotion this week included Caleb asking for and taking the mountain Moses promised him in the promised him. Numbers 13 and Joshua 14. Caleb drove out the sons of Anakim Joshua 15:14 for the Lord was with him and he wholly followed the Lord. These were the giants that melted the hearts of the 10 spies. Then these spies brought forth an evil report convincing Israel they couldn’t overcome. But Caleb said “we are well able to overcome it.” Standing with our WWP’s taking authority and. Driving out those with evil reports for the Lord is with us and we are taking back this mountain. You got it done! When I heard Susan Collins speak, marveling at the quality content and clarity, I saw God’s instrument. But it wasn’t really Susan Collins, it was Billye Brim and company. You all broke it through. I could sense the change in the spirit. Thank God. We are all going to be part of this praying Church in these days. We will raise the standard against the enemy’s flood. Praise God so much. I am so astounded by the grace of God. I remember back in the early 2000’s when Senator Grassley was investigating the “Faith Preachers” and Mega Churches demanding several to release the records of their donors and such to Congress. I remember how Bro. Copeland insisted we walk in love about the entire situation and walk in the wisdom of the Lord. At that time I was from the old school where you prayed against people personally. You (Billye Brim), Lynn Hammond, Lucy Mckee, Terri Copeland Pearsons, and Patsi Camanetti along with Iva Bennett taught me so much in prayer during that time. I never would have thought that the time would be that Sen. Grassley would be on the side of the Church but watching all of this come to pass over the past few weeks I have learned even more from the mature pray-ers who have taken it all of this to the throne since 2008 when Pastor Terri Copeland Pearsons declared that “We’ve Got Our Country Back!” while the E-flat note was being played prophetically on the piano. E-flat is the note of liberty and the note to which the Liberty Bell is tuned. These truly are prophetic times.